Cycling. It’s faster than skating, cheaper than driving and apparently better for you than walking. But the standard bike is not a typically simple object to manoeuvre or pop into the car with little thought. 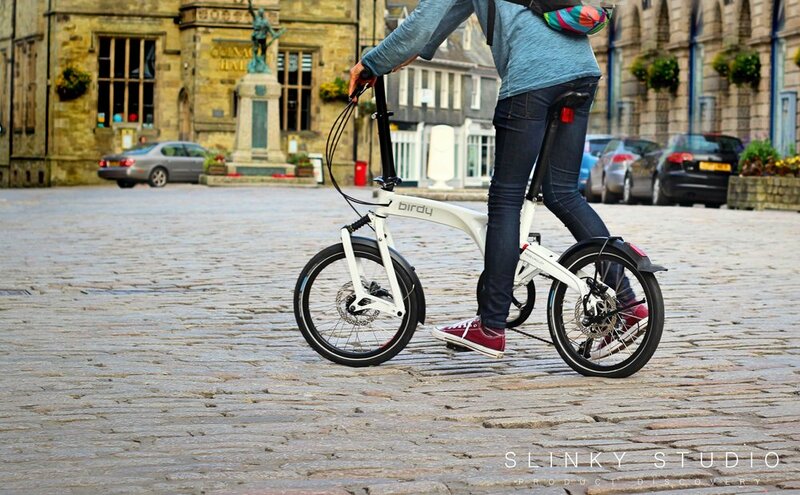 Hence the folding bike exists; but then comes the question of how quick it will be to fold and transport and can the ride be comfortable enough for the daily commute or light weekend trail? 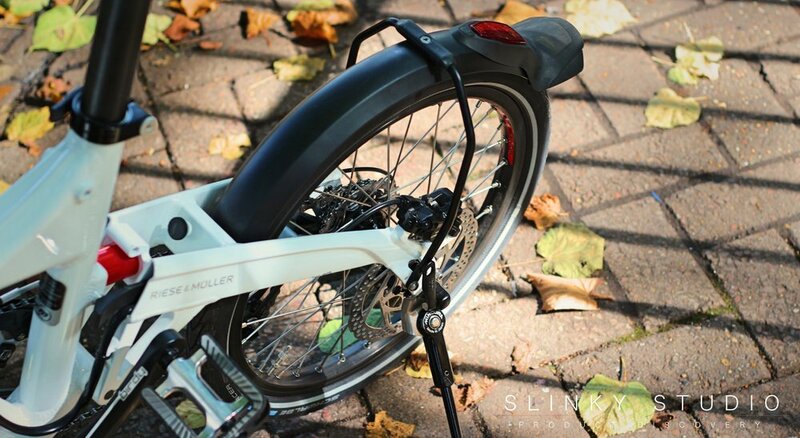 Well, we’ve been investigating all this with the £2,069 Birdy Speed folding bike (Mark 3) - a German design from Riese & Müller that aims to shatter the conception of sacrifice that comes with the foldable bike purchase. The Birdy doesn't look like it’s been crafted to suit practicality, which is something that could not be said about the comparable Brompton bikes with their classical design approach - and in general terms the fact is that most foldable bike designs get a lot of stick about looking a bit weird. Instead the Birdy loses the notion of stiff lined frames for muscular curves and stylish detail and proportion. Our all white hydroformed frame with black contrasting handlebars and seat-post projects the 21st century modernist bicycle design throughout - cyan, graphite matt black and lime frame colours are also available with optional contrasting coloured components. More pleasingly the spec sheet reads like a good 'off the shelf' road bike too. With a single-piece high-grade aluminium frame, aluminium everything else (well almost), full suspension, hydraulic Shimano Deore disk brakes, Shimano Ultegra 9-speed derailleur gearing and high pressure Schwalbe Marathon Racer tyres. It’s a very tight build and feels fairly indestructible in both its unfolded and folded states. A kickstand stops the bike from falling over on uneven ground; although such hard surface topples have already met our Birdy and after feeling the full brunt of the pain our little Birdy has only claimed what we like to call ‘character building’ paint scuffs - so very minor damage, all in all, with the build quality proving to be extremely durable. Everything listed above inevitably helps to justify the £2,069 asking price, but the ride and foldable design both need to be up to a high standard too, and we reveal the outcome of our thorough testing of these important practical points below. You may well be scratching your head asking 'where’s the hinge?' - there isn't one! Yes, Riese & Müller present an unconventional foldable design that makes quite a lot of sense. You see, the rotation contacts within the suspension on the front and rear wheel serve as folding points. On our first attempt to fold the Birdy with no instructions to hand it was not intuitive enough for us to just go ahead and complete the task - we admittedly got confused and failed. So we turned to YouTube to see how it’s done, where we were presented with the impressive skills of some riders completing the entire fold in less than 10 seconds. The basic way to think about it is that it’s a four step process: The back wheel needs to be tucked in, the saddle can be clipped to fully slide down, then the front wheel can be unclipped via the suspension support to collapse into the now compact shape formed, and lastly the handlebar unclips to neatly swivel aside. Once the order of dissembling is grasped the process becomes easier and quicker by the day - we can currently proudly boast completing the fold in under 30 seconds! In this state the bike is fairly easy to manage on trips from the house to the car. We were pleased and surprised to find that the Birdy happily sits in the boot of our BMW MINI Cooper without the seats folded down! But we’ve learnt the hard way that you don’t want to carry it for half an hour around a busy city environment, as such constant lugging of this 11kg mass will only end in soreness. Instead a luggage wheeler accessory that clips on is a must have and will allow the bike to be glided around if going any distance where cycling is off limits. We’ve got so quick at unfolding/folding that we can stop outside a shop or building, hop off, fold the bike and take it with us. It’s far quicker than finding somewhere to chain the bike and much safer than leaving it rested outside. 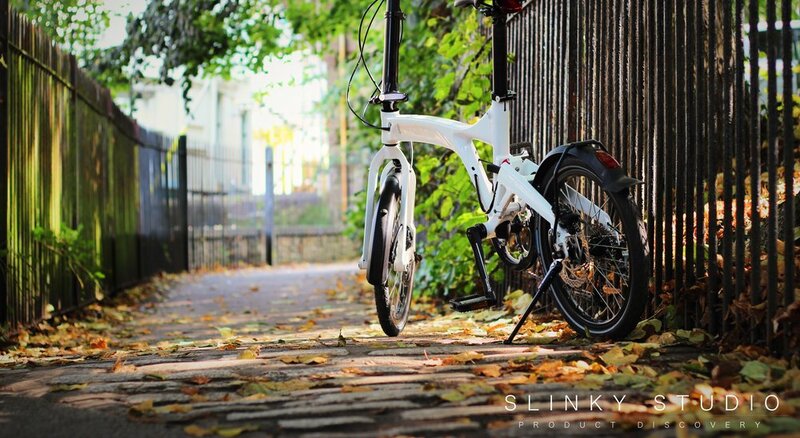 Folding bikes have often been engineered with nearly all the focus on the foldable design, making the ride a stiff by-product suitable for near exclusive on-road riding. 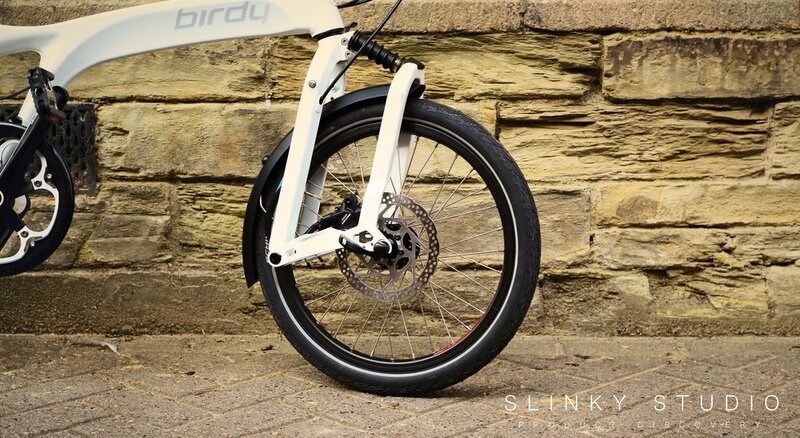 The Birdy is ironically a large breath of fresh air and its design has evidently been considered to marry ride and foldability into a complete package. Foremost it’s an easy bike to hop onto due to that low profile step-through frame - a very important factor for us when mounting and dismounting in busy urban environments. The feel of the bike on a tactile level was pleasing too. We all commented on the substantial grip the handlebars provide, and the fast gearing is within comfortable reach. 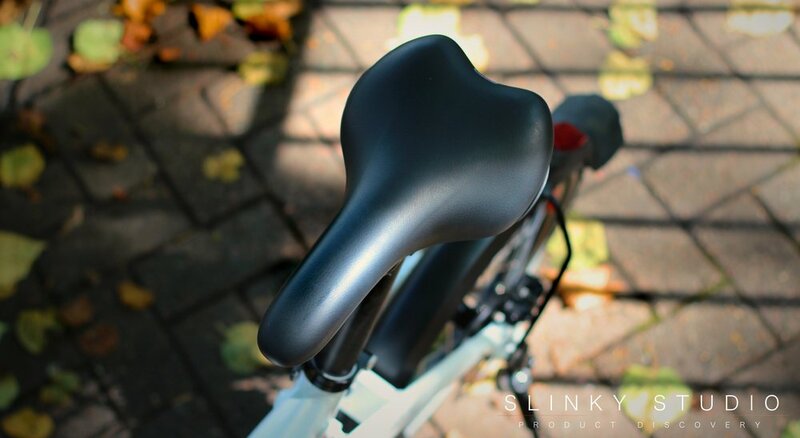 Furthermore, the saddle isn't an ache to rest on for strenuous up-hill cycles and long riding durations - it feels in terms of posture like a full-sized upright cycling experience. Not to neglect to mention that hot-swapping between riders of different heights is as easy as it can be, with quick-release height-adjustable stem and seat-posts (persons between 1.50m - 1.95m in height). 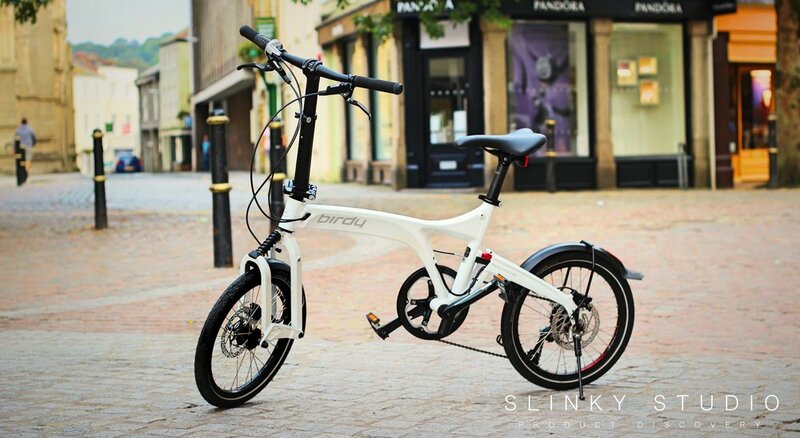 What the Birdy does particularly well is to tear up the well known image of the slow and dithery folding bike. The single frame design, downforce elastomer suspension and high pressured 18” wheels establish a firm yet smooth ride that can happily exceed 35mph. 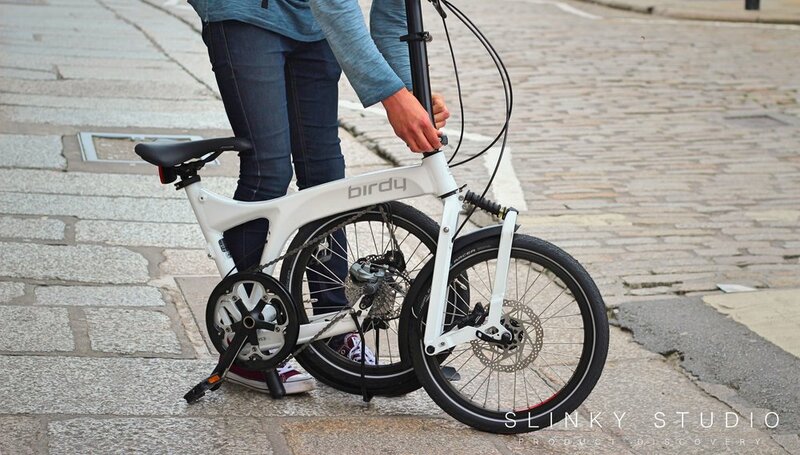 This engineering makes the Birdy not really ride like a folding bike but instead feel more like a hybrid. Acceleration is quick with the 9 speed gearing leveraging a dramatic difference between each ratio increase. Gears change in a snap and skipping multiples at a time is no concern at all - the chain always establishes connection. This is tremendous for cycling within urban environments where jetting away from drivers who are oblivious to your presence can be a genuine threat. Moreover we can tackle steep inclines for half an hour with little exhaustion to show for it. Relentless peddling moves the Birdy along quickly and if you take it easy after putting the work in the Birdy will reward you with mighty progressive momentum. Seriously this thing freewheels for what seems like an eternity! All of which make this bicycle an enjoyable experience to be saddled on top of, and whilst the centre of gravity obviously feels lower and turning a little less punctual, we don’t find we are top heavy or ill-balanced when zigzagging around obstacles or making last second turning decisions. 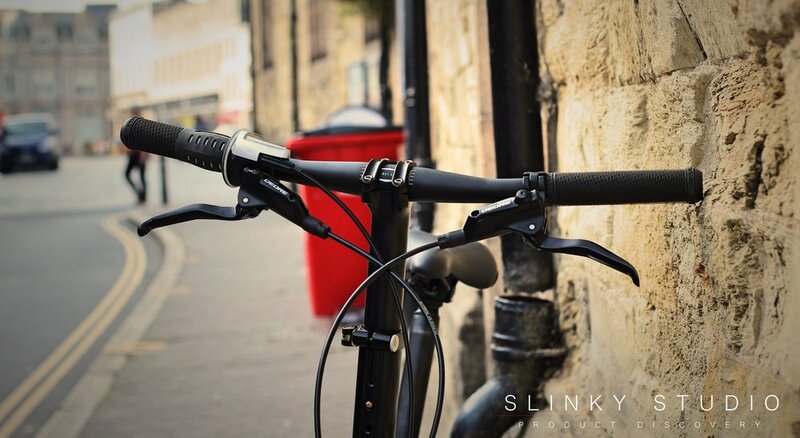 We found the Birdy lent practical zippiness on our short stints around cobbled city streets with heavy traffic, and on longer commutes it fills the gap with comfort and real enjoyment. 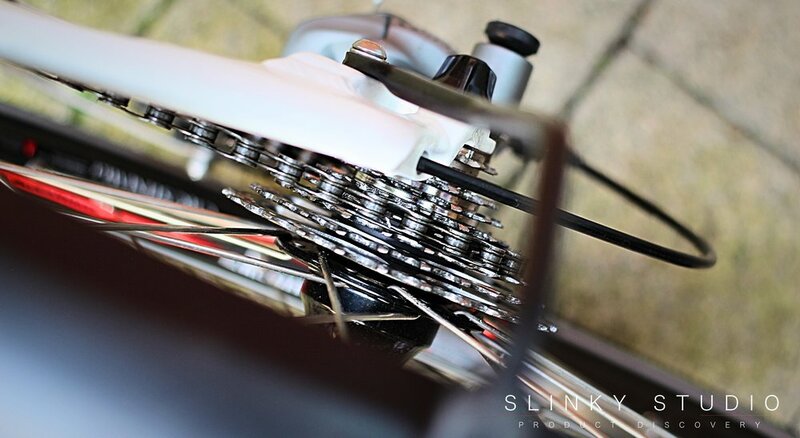 Bringing all this speed to a stop are the hydraulic Shimano Deore disk brakes which we found take longer to get accustomed to than the folding design! Be warned: a squeeze on these and the Birdy thuds to a definite stop. Whilst it’s nice to know such immediate braking is available, it’s hard to remember this when we preemptively tap the brakes without paying much thought, like we normally would on a road bike, and have the Birdy’s wheels be near completely paused in rotation with the surface below - there isn't much transition on the triggers. Speaking of wheels, the 18” Schwalbe Marathon Racer tyres are high pressure but still fairly forgiving. Cobbled roads and curb hopping gain only diluted vibrational sensation by the time they hit the rider. No doubt the frame design and coupled full suspension assist in this. In fact, we experience more feedback from some of our dedicated road bikes. So this reasonably cushioned ride lends it to travel off the beaten track, where the tyres cling to the ground and they don’t mind treading over loose stones and wet surfaces. But we do have a criticism, discovered whilst riding up steep inclines where exhaustion sets in. You see, because the rider is upright and their weight is distributed towards the rear middle of the bike, tiredness causes him or her to cling to the handle bars when pushing down on the pedals travelling up steep inclines, and it is at this point that the front wheel can lift away to topple the bike's weight towards the rear wheel. It's a feeling that is quite scary, but only on seriously steep inclines when tired - although it is something worth noting. Apart from this fairly unusual and rare point, we’ve endeavoured to truly find out if it's a bike that commuters will enjoy and discovered with some surprise it’s a bike that all cyclists will enjoy! 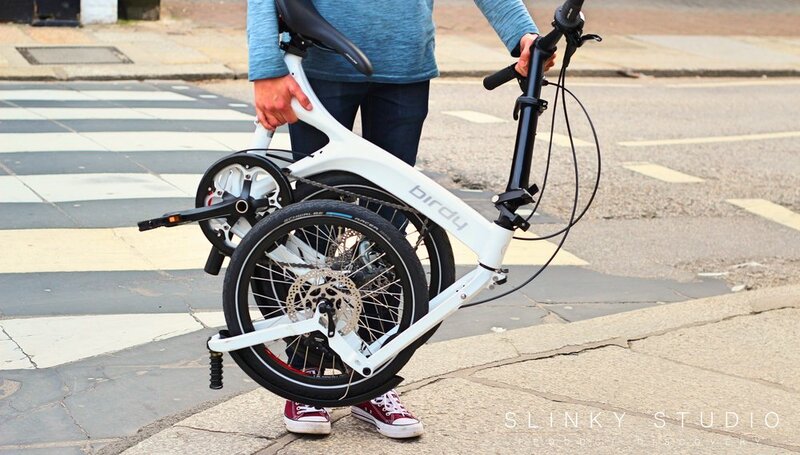 Because of the previously discussed marriage between foldability and ride quality, riding from A to B around towns and cities is where the Birdy bike wiggles in and makes an unusual appearance where the traditional full sized road bike would seem impractical and a hassle. 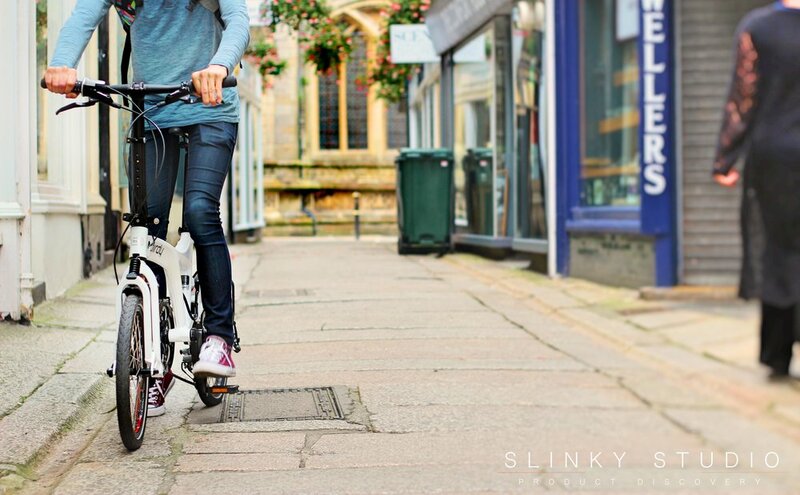 A great example is when high street shopping - sure we’d take a skateboard or longboard with us to get from place to place quickly from the car, but a bike would seem too much of a headache for such short-distance trips. Whereas the Birdy aligns itself more so with the four wheelers, and once it becomes second nature to unfold, it makes fast and enjoyable transport in place of walking without the typical road bike sacrifices. The Birdy is an excuse to cycle nearly everywhere. 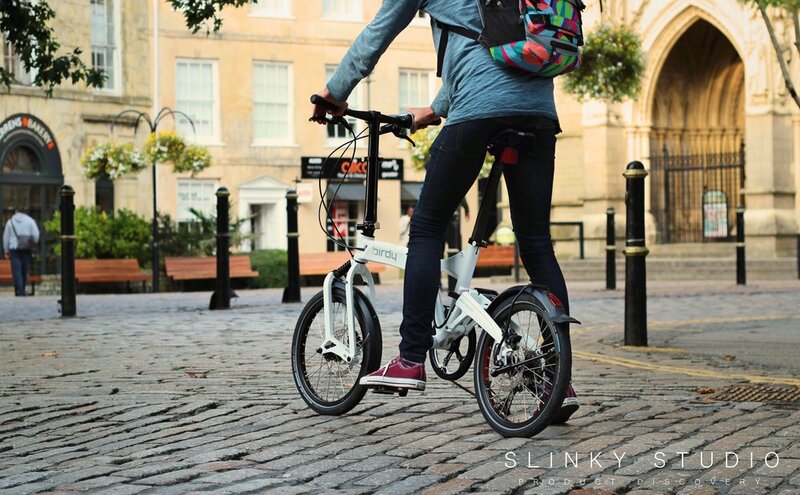 Its design is as much about nimble compact foldability as it is about being a pleasure to ride. There’s little sacrifice needed: it’s got the gears to see it up hills, the speed to beat the clock to work and the manoeuvrability to safely leave behind stop start traffic. A good thing that comes in a small package.